'The only way to get close to those glittering stars in heaven is, to look at a soldier with stars on his shoulders' Every time, they're around, the thing that we see is the bravery awards, medals, the pride, but what we can't see is their heart that lies inside the iron chest, some untold stories, sacrifices, and the hardship they've been through. Every soldier has a story that is unique and extra ordinary. 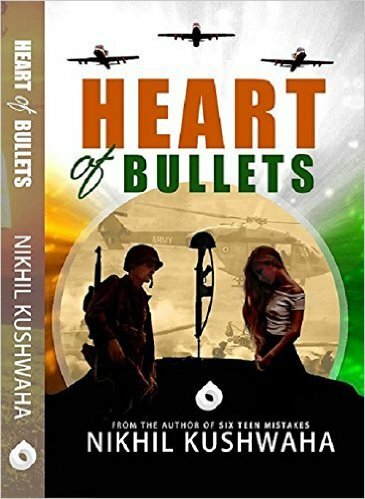 A tale of brotherhood & heroism, a tale of love & betrayal, 'Heart of Bullets', is about two best friends, Arpan & Sam, and the untold story of their friendship, untold story of their love, Shradha, but what happens when Sam gets hit by the enemy - across the border? What will Arpan do to save his friend? Will love prevail over friendship of lifetime? There is a decision to be made, is the life without love, and friends, better than dying to save the one we love the most? 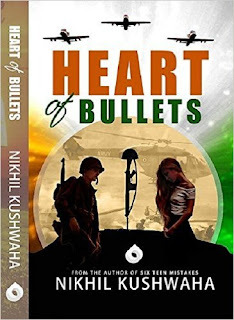 heart of bullets publised by petals publishers, edited by the publisher himself *i felt another good story would have been created into a disaster* as the name suggests, is a story basically dedicated to our brave indian soldiers *indian army*. the novel starts with the heroic description of the war scenes by the protagonist Arpan, followed by the friendship tales of Sam, Arpan and Shradha, ends on a good love story and of course a big sacrifice by sam's dear friend Arpan just to safe his life. i sincerely don't want to discuss the story in detail * as i genuinely feel the story should not be discussed and i don't want to finish the suspense too* let the reader do that, but yes as the cover pic depicts it's a story dedicated to the heroes, but actually 70% of the noevl is a love story and only 30% weightage is given to the war sequences, brave incidents. well that's not the mistake of the author, it's the cover designer who got confused with the title and the theme. coming back to the story line, i feel the reader might feel dejected, as the reader will pick the copy thinking it might be a novel dedicated purely to the soldiers, but at the end that's a swet love story. The author has rightly balanced the love story and the story of soldiers too, the 3 war sequences have been amazingly described. Nikhil has wonderfully started each and every chapter well, complimented with some mesmerizing poems * that connects with the chapters well *, punchlines and one liners which sum up the stanza well in a beautiful manner, and eventually will make you fall in love with his writings. it could have been much better if the editor would have paid some focus on the mistakes, well never mind, when a book is coming from petals * one can expect poor quality of printing, 'n' no. of mistakes, no editing, and of course grammatical mistakes and not to forget silly typos "also known as Makkkkkaaaaaaarrrrr's forte". overall heart of bullets is a delightful read, if you ignore the publisher and his forte.